• Audio Commentary - this archival audio commentary features Norman Jewison, cinematographer Haskell Wexler, and actors Rod Steiger and Lee Grant. It was recorded in 2008, and has already appeared on other home video releases of In the Heat of the Night. • Norman Jewison - in this new video interview, Norman Jewison recalls how he was given John Ball's novel and his first thoughts on whether it could make a good film, and discusses his work with various cast and crew members during the production of In the Heat of the Night. The interview was conducted exclusively for Criterion in Toronto in 2018. In English, not subtitled. (13 min, 1080p). • Lee Grant - in this new video interview, actress Lee Grant discusses her blacklisting in Hollywood and how it impacted her acting career as well as her contribution to In the Heat of the Night. Sadly, the interview contains expletives that make parts of it sound like extracts from a political outburst. The interview was conducted exclusively for Criterion in New York in 2018. In English, not subtitled. (15 min, 1080p). 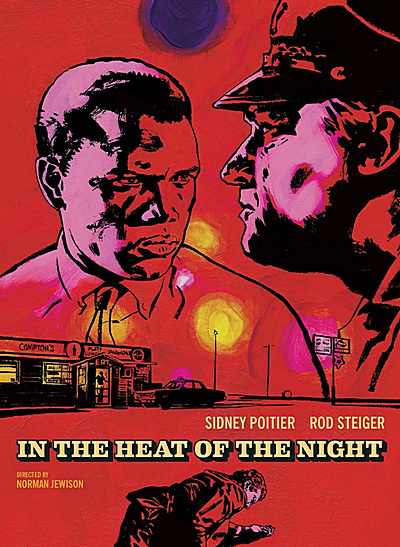 • Sidney Poitier - in this archival video interview, Sidney Poitier recalls how he became involved with In the Heat of the Night and explains it was risky project at the time when it was initiated. The interview was included in the American Film Institute's 100 Years... 100 Cheers television special which originally aired on June 14, 2006. In English, not subtitled. (8 min, 1080i). • Aram Goudsouzian - in this new video interview, Aram Goudsouzian, chair of the history department the University of Memphis and author of Sidney Poitier: Man, Actor, Icon, discusses the evolution of Sidney Poitier's career and the type of characters that he played and eventually solidified his image as a Hollywood star. The interview was conducted exclusively for Criterion in Memphis, Tennessee, in October 2018. In English, not subtitled. (18 min, 1080p). • Turning Up the Heat - this archival program takes a closer at the production history of In the Heat of the Night. Included in it are clips from interviews with director Norman Jewison, producer Walter Mirisch, filmmakers John Singleton and Reginald Hudlin, and film historian Patricia King Hanson, amongst others. The program was produced in 2008. In English, not subtitled. (22 min, 1080i). • Quincy Jones - this archival featurette examines focuses on Quincy Jones' career and the unique soundtrack that he created for In the Heat of the Night. Included in it are clips from interviews with the Grammy-winning composer, jazz legend Herbie Hancock, and film music historian Jon Burlingame, amongst others. The program was produced in 2008. In English, not subtitled. (22 min, 1080i). • Trailer - an original trailer for In the Heat of the Night. In English, not subtitled. (3 min, 1080p).